Are you ready to work your arms and legs today? I hope so! It’s day 24 of my 4-Week workout challenge. If you are just finding the challenge you can hop right in, or start at the beginning with Fit & Healthy Workout Challenge: Week 1 Workout Schedule. For today’s workout combo you will need a couple of dumbbells & a chair or bench. Choose a weight that is challenging to you. Aim for 30-60 Minutes of total workout time today. You can repeat the workouts and/or add 30-Minutes cardio of choice to increase the burn. This jump rope workout is a great option for an added cardio burn: 10-Minute Jump Rope Skipping Workout. I hope you enjoy today’s workout. I taught my boot camp class last night and I am feeling great going into today. Be sure to support your workout with healthy food choices. 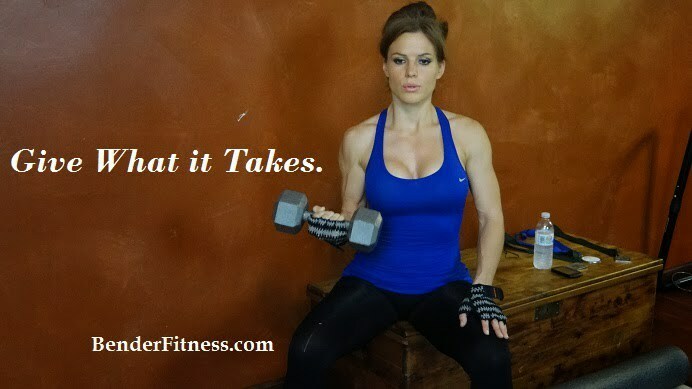 Your food will fuel your body through the workout, and through your day. I have dinner in the Crock Pot, and barring any complications I am planning on filming a brand new workout tonight. I am 18-weeks (4.5 months) pregnant today, so you will be seeing some baby bump in the new workout! I followed a Skinny Taste recipe for dinner this evening. We are having Crock Pot Chicken Taco Chili. I am looking forward to trying it! I am off to work! Have a great day! Just wanted to say thanks to you and Jesse and all you do. I have been following you for over a year now and am so greatful. Not to mention you help me on the daily keep fit and healthy….. its free. I am a fan of other IG work out sites and after a week they all want money. Thanks again for all you do and so excited for baby Bender! Yikes! That combo was a killer! Thanks for all the great workouts!! I have to get myself some heavier weights… but not too heavy… as opposed to popular beliefs I, as a female, can bulk if not careful… and you can’t tell me otherwise… some female bodies are prone to it. Hi Melissa! I haven’t done the sculpted arms workout in quite a while and I can definitely see an improvement this time through. I can now make it through 20 reps of each pushup variation 2 times through! First time I did this ages ago I could barely do 10 reps and only one round. Finally my hard work is showing. Thanks guys!